Sorry for all the downtime-- this thing will be up and happening again very soon, especially considering all the juicy fun I have been receiving via text message from the twitter accounts of My Chemical Romance. Over break, I found that Gerard Way is desperately searching for a 1979 Trans Am, and he means it. Don't believe me? Just go to My Chem's website and see for yourself. If you guys find any sweet cars (he prefers silver with red interior in the California area), send him an @Reply (@gerardway) on twitter, and it is likely that he will get back to you. I just wanted to let you all know that I will be leaving for Florida tonight and will not be able to grace you with my bloggy presence for a while. Yes, that Senses Fail review is still going to happen along with many more goodies. You will see! This entry I am thinking about making a mandatory read for all who visit this page. Bill And Trav's Bogus Journey Tour reviews! Now with page navigation! Taking Back Sunday show reviews also with navigation! Speaking of TBS-- this week has been pretty huge for them! Not only did the band announce dates for their Spring tour with Envy on the Coast and Anberlin, but also gave fans a new "definite" release date for New Again: June 2nd. Oooohhhh excitement! See you guys next week and all this week on Twitter. By going to My Chemical Romance's website, one can now preview footage of the band performing Give 'Em Hell, Kid from the their upcoming USB release, ¡Venganza!. Remember that snazzy My Chemical Romance vest and flash drive I told you about? You can pre-order it by clicking the banner to the left! Orders are set to arrive around April 10th! "¡Venganza!" which is Spanish for "Revenge!" is the title of this release for good reason. The final performance MCR did as their alter-ego counterparts from Italy, The Black Parade, was filmed in Mexico City, and the Parade half of the performance was released on their DVD, The Black Parade is Dead! last summer. Get it now? Ah ha! Have I really, honestly, since I got my tickets months ago, not mentioned this show?! Well, I'd say there's no time like the present, especially since the show is now mere days away. On Thursday, March 12th, yours truly will be found in Columbus, Ohio at a little venue called The Basement to see Senses Fail. This by-way stop from the Saints and Sinners Tour which features Hollywood Undead, Haste the Day and Brokencyde has had me squealing excitedly for months. 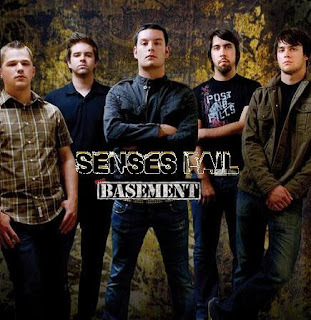 Between Cleveland and Cincinnati, Senses Fail will be taking a break from the Saints and Sinners line-up to play a solo show with two local Columbus bands at The Basement. Compare the size of The Basement (200 capacity) to Saints and Sinners venues (avg. 1500), and this is sure to be an intimate surprise for fans. This morning I, as is routine, visited the My Chemical Romance website to see what the blogs had to tell me-- after watching a friend of the band perform "5 Dollar Footlong" metal style, I navigated back to the My Chem site and had nearly left it for google when something amazing caught my eye in the left corner of the screen. Could it be-? Yes, it was a bulletproof vest replicating the one that Gerard wore during Warped Tour 2005! Half of my aesthetics come from that very era in MCR history, so naturally I clicked and was only introduced to even more goodies when I got to the site to pre-order the vest, which -as it turns out- is only a side item. Clipped onto the vest comes a BULLET-SHAPED USB DRIVE containing live photos of the band along with 9 performances not seen on their latest DVD, The Black Parade is Dead!. Hey, everyone. I just wanted to take a moment to thank everyone who reads my babblings once more and -hopefully- give you something to which you can look forward. I got smacked in the face with blog inspiration at a Speedway station outside of Columbus on Friday. As my friend pulled her car to the pump, a familiar man walked from the station. The three of us in the car looked at him, tilted our heads to the side with familiarity, then said in something remarkably close to unison, "What up, Hawthorne Heights." which evolved to, "That guy looks like the dude from Hawthorne Heights," then finally, "That is the guy from Hawthorne Heights." While waiting for my friend to finish filling her tank and occasionally glancing at the drummer at the next pump, I thought about my blog, and I realized something significant that I had been neglecting in it: REPPIN' DA 9-3-7, YO! Eh em, I mean, supporting my hometown artists.